Vermont was originally home to Native Americans of the Algonquian and Iroquois tribes, before colonists from Massachusetts, New Hampshire and New York each claimed the area as their own. In 1777, Vermont was declared an Independent Republic – although for the first six months it was called New Connecticut – and, in 1791, it became the 14th state of the Union, the first that was not one of the original thirteen colonies. During the Revolutionary War, the Battle of Bennington (named for the town in southern Vermont, though the conflict actually occurred across the border in New York) was a crucial victory for the colonists and is considered to be, alongside the success at the Battle of Saratoga, as the turning point of the campaign. In its first constitution, drafted in 1777, Vermont abolished slavery and the state was at the forefront of the abolitionist movement from the outset. A 1854 report on slavery by the Vermont Senate questioned how a government could favour the rights of one group over another, which elicited a response from the Georgia General Assembly, as they passed a motion authorising the northern state to be towed out to sea. Vermont gave Abraham Lincoln his largest margin of victory of any state in the 1860 election and, although it was far from the site of any major skirmishes during the Civil War, it sent over 34,000 men to fight in the Union forces, including the 2nd Vermont Brigade which helped break Pickett’s Charge at the Battle of Gettysburg. The state also had three military hospitals that were regarded as being the best in the country for the rate of curing injured soldiers. Vermont is the sixth smallest state by area and its 626,000 residents constitute the second lowest population of any state in the Union. Its economy is based around agriculture, in particular dairy-farming; manufacturing, the largest for-profit employer is IBM; and health services. The state is the largest producer of maple syrup in the USA and is the home of Ben & Jerry’s ice cream. Two Presidents were born in Vermont, Chester A. Arthur and Calvin Coolidge; while the state capital, Montpelier, is the only one in the country that does not have a McDonalds in it. Although it has no Major League sports teams, Burlington – the largest city – has the Vermont Lake Monsters – a Single A affiliate of the Oakland A’s – who are named for Champ, the mythical sea creature of Lake Champlain. That is not a typo, in the most recent poll, carried out in August by Castleton Polling Institute – President Obama had a 62% to 25% lead over Governor Romney, meaning that it is not a spoiler to call Vermont to go blue on November 6th, even with so many weeks to go before the election. Support for the Democratic candidate is a relatively new development in Vermont – prior to 1992, the state had gone blue just once, in 1968. In the last 20 years it has been a stronghold for the party, with Clinton (twice), Gore, Kerry and Obama all achieving success there in their Presidential campaigns. Congress: There is one Senate election in Vermont this year, the great Bernie Sanders (Independent) is seeking re-election for a second term, having served as the state’s House of Representatives member for 8 terms prior to that. The only Senator who does not get offended by someone calling him a Socialist, Sanders is a big favourite to beat the Republican candidate, John MacGovern, in November. Rep. Peter Welch (D) is seeking re-election for his fourth term in the House of Representatives in the at-large district of Vermont and is expected to win by a large margin. The Democratic Party should make it a clean sweep in the state in the Gubernatorial election, as incumbent Governor Peter Shumlin has a large lead over Randy Brock (R). Vermont is one of only two states in the USA – along with its neighbour, New Hampshire, that elects its Governor to a two-year term, rather than four. In the much hyped super-sunday fixtures last weekend in the Premiership, Manchester United won at Anfield for the first time in five years; while Manchester City were held to a draw by Arsenal. Wenger’s men dominated the first half and were unlucky to be behind to a Joleon Lescott header at the break, but they gained a point thanks to a Laurent Koscielny equaliser inside the final ten minutes. The stalemate moved both clubs onto 9 points from their opening five games of the season, with both unbeaten to this point, but Manchester City do not seem to have found their form yet and Mancini appears unsure of his best team. United’s win at Liverpool was aided by the home side being reduced to ten men inside 37 minutes, when Jonjo Shelvey was dismissed for a foul on Jonny Evans. Despite being short on numbers, Brendan Rodgers’ side took the lead just after the interval through a Steven Gerrard volley, but a curled shot by Rafael and a penalty by Robin Van Persie secured the points for Manchester United. 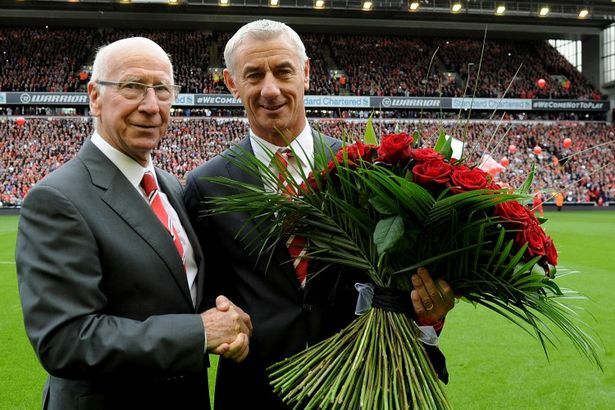 Prior to the start of the match, there were observances made for the victims of the Hillsborough tragedy: the Old Trafford legend and Munich air crash survivor, Sir Bobby Charlton, presented a bouquet of 96 red roses – one for each victim of the disaster – to Ian Rush, Liverpool’s all time record goalscorer; plus Gerrard and Ryan Giggs released the same number of red balloons into the sky. Before the game, without fuss, Luis Suarez and Patrice Evra put their differences aside and shook hands – a welcome relief after the Ferdinand/Terry/Cole shenanigans of the previous weekend. Before the arrival of European settlers, North Carolina was home to Native Americans of the Iroquois, Algonquian and Siouan tribes. Spanish explorers were the first to arrive from the Old World, but it was Queen Elizabeth I of England who sought to establish colonies there, granting a land charter to Sir Walter Raleigh for that purpose. Both of Raleigh’s attempts failed and the second one came to be known as “The Lost Colony”, as the settlers on Roanoke Island disappeared without a trace, along with all of their houses, leaving just a single word – “Croatoan” – carved into a tree. It was on that same island that the first English child to be born in America – Virginia Dare – was delivered in 1587. It was not until the middle of the 17th century that a new, lasting colony – Carolina – was established, which would split into North and South in 1710. During the Revolutionary War, opinion was divided in North Carolina between those who wanted to stay loyal to the crown – mainly due to existing business interests with Britain – and those who wanted independence, until the Patriots victory at King’s Mountain swayed loyalists to their side. One of the crucial conflicts of the war – the Battle of Cowan’s Ford, was fought in Mecklenburg County and, even though it resulted in a victory for the British, the number of casualties they suffered led to their eventual surrender at Yorktown. Tobacco production was a major industry from the outset for North Carolina and many men were brought over from Africa as slaves to work on the plantations. By 1860, one-third of the state’s population were slaves, with a further 30,000 free African-Americans, who had moved south from Virginia. North Carolina was the second to last state to formally secede from the Union and join the Confederacy, doing so only when President Lincoln instructed them to invade South Carolina in 1861. Of the estimated 125,000 men from the state who fought for the Confederate forces during the Civil War, approximately 20,000 were killed in battle, with a similar number dying from diseases. As in all of the Southern states after the war, race relations did not improve and the Ku Klux Klan was active in North Carolina, as were attempts to disenfranchise African-Americans through means such as poll taxes or residency tests. From 1929 until 1979, the state had a eugenics program, through which had forcibly sterilized people who were considered to be feeble-minded – with those from ethnic minorities disproportionately targeted. After the Civil Rights Movement of the 1960s, African-Americans were finally able to participate fully in all areas of society and, in 1973, Raleigh elected its first black mayor, Clarence Lightner. After being reliant on cotton and tobacco production for so long, North Carolina’s economy is now well diversified and the state has financial, engineering and biotechnology companies located within its borders, as well as being famed for its furniture. It is the 28th biggest state in area and has the 10th largest population, with just over 9.6 million residents. “Research Triangle”, the area around the cities of Raleigh, Durham and Chapel Hill in the western part of North Carolina, is home to three renowned colleges – Duke, University of North Carolina and North Carolina State. The Outer Banks on the Atlantic coast is a popular tourist destination and was the location for the Wright Brothers first successful powered flight, at Kill Devil Hill. Two Presidents, James Polk and Andrew Johnson, were born in North Carolina and the state is home to three “Big Four” sports teams – the Carolina Hurricanes (NHL); Carolina Panthers (NFL) and Carolina Bobcats (NBA). From 1932 to 1964, North Carolina voted for the Democratic Presidential candidate in every election up until Richard Nixon won the state in 1968. After that, the GOP took the state in 9 of the next 10 contests (the exception being 1976, when Jimmy Carter was victorious) until President Obama claimed North Carolina’s 15 Electoral College Votes in 2008. It is a swing state for November’s race for the White House, but defeat there would hurt Mitt Romney a lot more than Barack Obama – should the President win North Carolina again this year, it would leave Governor Romney needing to take Ohio, Florida, New Hampshire, Virginia, Colorado and Nevada, leaving no margin for error. Congress: There is no Senate election in North Carolina this year. Of the 13 members of the House of Representatives, seven are currently Democrats, with 6 Republicans. The GOP is looking likely to gain three seats in November’s election, with their candidates favoured in the 7th, 8th and 11th districts. Governor: The incumbent Democratic Governor, Bev Perdue – the state’s first female Governor – is not seeking re-election for a second term and the race is between Pat McCrory (R) and Walter Dalton (D). The Republican candidate currently has a 12.5 point lead in the polls. Prior to the arrival of European settlers, New York state was home to Native Americans of the Iroquois and Algonquian tribes, who had developed an advanced economy and sophisticated cultural systems. In 1524, Italian explorer Giovanni Verrazzano – for whom the bridge connecting Staten Island and Brooklyn is named – sailed into New York Bay, but it was nearly another century until settlements began to arise. An Englishman, Henry Hudson, explored the river which now bears his name and set up a trading post – Fort Nassau – with the Native Americans, located where Albany now sits, but he was working for the Dutch East India Company, thus it was that nation that first lay claim to the land. New York City was called New Amsterdam by the Dutch but, when the English captured it during the Second Anglo-Dutch War, they renamed it after the Duke of York. The small trading post was regained by the Dutch in the third war between the two nations and they changed its title once more to New Orange. In 1674, the Treaty of Westminster handed control back to the British and thereafter the name remained as New York. During the Revolutionary War, New York was the location of nearly one-third of the battles that were fought, including the Battle of Long Island, which took place in modern-day Brooklyn Heights. In 1777, the Americans achieved a significant victory in the Battle of Saratoga, a success that is now considered to be the major turning point in the war and that convinced the French to support the independence of the thirteen colonies. After the British had been defeated, the last remnant of their authority in America departed from Manhattan, as the final troops left on November 25th, 1783, later to be known as Evacuation Day. New York City was the first national capital – before Philadelphia and then the new city of Washington D.C. replaced it – and George Washington was sworn in as President in Lower Manhattan, on what is now Wall Street. Although there were not battles fought there during the Civil War, the Union Army had more men from New York than any other state. After the Emancipation Proclamation of 1863, locals feared that freed African-Americans would migrate north looking for work, adding to the competition for low-paid jobs in New York and sentiment was worsened when a draft lottery was announced. Those who could pay $300 were able to avoid being conscripted into the army and it led to working-class men – mostly of Irish descent – rioting for five days in New York City, during which African-Americans were targeted by the mob, with approximately 100 being killed. In many areas, New York has been a pioneer of progression: the first steamboat line was started by Robert Fulton from New York to Albany; the Erie Canal was a monumental construction project that linked the Atlantic Ocean, via waterways, to the Great Lakes; in the 1850s, the political machine of Tammany Hall, led by “Boss” Tweed, was the most successful and enduring of its kind; Ellis Island was the main hub for immigration between 1892 and 1954, as more than 12 million immigrants were processed through there during that time; and at the beginning of the 20th century, new skyscrapers in New York City were regularly winning the moniker of “tallest building in the world”. After the Great Depression in 1929, then Governor Franklin Delano Roosevelt created the Temporary Emergency Relief Agency, whose goal was to provide a work-relief program for those most affected by the economic downturn, and was a progenitor of the nationwide New Deal he introduced after being elected President in 1932. Ranked 27th in size, the more than 19.4 million residents of New York make it the 3rd most populous state – approximately 8.1 million of those are located in New York City, with Brooklyn alone being home to 2.5 million people, which by itself would make it the fifth biggest city in the United States, had it not joined forces with the other four boroughs in 1898. The state has been the birthplace of four Presidents (Martin Van Buren, Millard Fillmore, Theodore Roosevelt and FDR), and three more considered it home (Chester A. Arthur, Grover Cleveland and Dwight D. Eisenhower). There are ten “Big Four” sports teams that affiliate themselves with the state – the New York Rangers and Islanders, as well as the Buffalo Sabres (NHL); New York Yankees and Mets (MLB); New York Knicks and the newly located, Brooklyn Nets (NBA); the New York Giants and Jets (who actually play in New Jersey), and the Buffalo Bills (NFL). Cooperstown, in Upstate, is the home of the baseball Hall of Fame. New York has voted for the Democratic candidate in each of the last six Presidential elections and that trend will continue in November. Congress: There is one Senate election in New York this year, as the Democratic incumbent, Kirsten Gillibrand, faces off against the GOP candidate, Wendy Long. Gillibrand won a special election in 2010 – as she was appointed to the Senate to replace Hillary Clinton, who took the role of Secretary of State in President Obama’s administration – and is widely expected to win another term this November. After reapportionment from the 2010 census, New York will have two fewer Representatives in the House, with its total now numbering 27. Currently, the Democratic Party has 21 seats to the GOP’s 8 and 11 of the 27 districts are expected to be close races, meaning control of the House could hinge on either side’s success in the state. In the record books, Week 3 of the 2012 NFL season will show that the Ravens came from behind to beat the Patriots, 31-30; the Falcons, Cardinals and Texans all moved to 3-0; and the Seahawks sent the Packers to a 14-12 defeat, leaving Aaron Rodgers winless in five starts on Monday Night Football. However, what the statistics do not show is how much of joke the officiating has become by the replacements, as the lockout continues between the referees and the league. 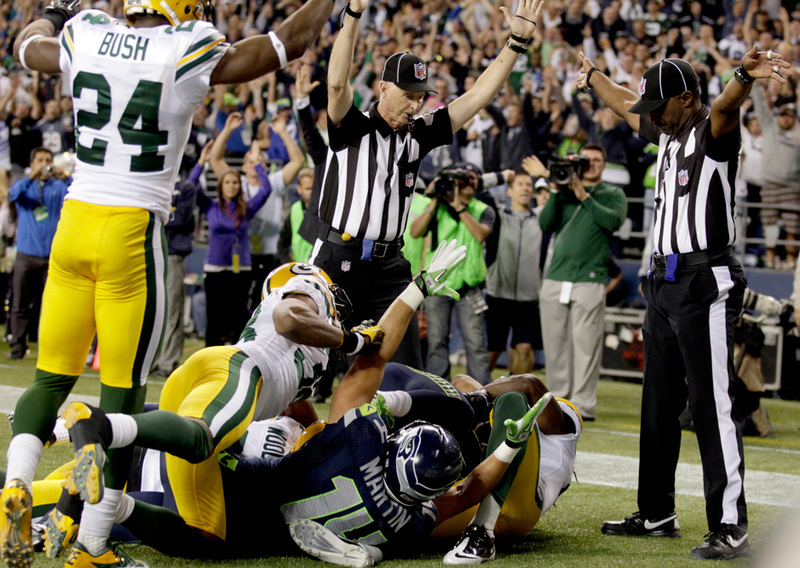 The nadir was reached on Monday night, when the Packers were robbed of a win in Seattle because of a terrible call giving the Seahawks a touchdown as time expired. While Green Bay’s offense should receive some of the blame for failing to score more than 12 points in the game, the inexplicable decision to award a touchdown for this play confirms that the league has descended into a joke. Commissioner Roger Goodell and the NFL were arrogant in assuming that they could push on with the games, despite not having reached a deal with the regular officials, who are experts at both calling the game and controlling the players. It should not be a surprise that the replacements are unable to deal with either aspect as effectively as the regular referees, yet the league pushed on with the season regardless. The erratic and incorrect rulings bring the credibility of the game into doubt, but there is also a much more significant issue of the potential for a player to suffer a serious injury. Goodell already showed his ambivalence to the dangers of concussions by pushing for 18 regular season games during the lockout of last year, but having these replacement referees has increased the risk significantly, as they have been missing helmet-to-helmet hits and the lack of control they exert over the two teams has led to contests getting more violent. While it may not be too much of a surprise that I would side with the workers on a pay dispute, the league is so profitable that it can afford to meet the pay demands of the regular referees – whose true value has been proven by the replacements. Before English settlers set up the Jamestown colony 405 years ago, Virginia was inhabited by Algonquian tribes, primarily those united under the Powhatan Confederacy. The colonists came into conflict with the Native Americans, leading to the two Anglo-Powhatan wars, the first of which was resolved when Pocohontas – daughter of the chief of the Powhatan tribe – was taken prisoner by the English, but ended up staying with them and marrying the tobacco trader, John Rolfe. Virginia was at the heart of the American Revolution and many of its natives played an important part in the birth of the nation – George Washington, the leader of the Continental Army and then the First President; Thomas Jefferson, author of the Declaration of Independence and the Third President of the United States; James Madison is considered the “Father of the Constitution”, as he drafted much of the document, and was the author of the Bill of Rights; and Patrick Henry, one of the chief proponents of Republicanism, and the man who gave a speech to the Virginia Convention which contained the phrase “Give me liberty, or give me death”. However, while the state can boast to having played a major part in the creation of the country, it was also at the forefront of the biggest wrongdoing in the history of the United States – slavery. Trying to make money from growing tobacco, the English settlers in the 17th Century brought over a group of 20 or so Angolans, which marked the beginnings of enslavement in America. It was because of the large number of slaves that were present in Virginia that the compromise of counting them as three-fifths of a person (for the calculation of how many Representatives in Congress each state would receive) was written into Article I, Section II of the Constitution. Of the 8 Presidents to have hailed from Virginia, 7 of them were slave-owners (including George Washington, with the exception being Woodrow Wilson, who was elected in 1912) and Zachary Taylor – the 12th to hold that office – declared it a Constitutional right, which should be defended with the sword if necessary. In 1831, it was in Southampton, Virginia, that Nat Turner led a slave rebellion, during which more than 50 white people were killed. According to the census of 1860, before the Civil War started, there were 490,765 slaves in the state, out of a total population of 1.6 million, showing how much their economy was reliant on the exploitation of African-Americans. It seceded from the Union on April 17th, 1861, the Commander of the Confederate Army, Robert E. Lee, was from there; and more battles were fought in Virginia than in any other state during the Civil War. The conflict also led to the creation of another state, when 48 counties voted to form West Virginia and stay in the Union in 1863. Like all of the other Southern states who formed the Confederacy, after the Civil War and a period of Reconstruction, Virginia enacted Jim Crow laws – racially segregating public facilities – and adopted measures like poll taxes to disenfranchise African-Americans (and poor white people also). While the Civil Rights Era in the 1960s brought an end to legal discrimination, not everybody has accepted the merits of the Confederacy’s defeat – in 2010, Governor Bob McDonnell of Virginia declared April 14th “John Wilkes Booth Day”, on the 145th anniversary of when he shot Abraham Lincoln. Tobacco has been a major part of the economy of Virginia, going back to the colonists, and coal mining has joined it as being a big industry. Both of these have been eclipsed in magnitude in recent years by technology companies and, by 2006, the state’s biggest export product was computer chips. Its proximity to Washington D.C. has resulted in Virginia being the location for many Federal Agencies, most notably the Pentagon (the largest office building in the world), in Arlington, and the CIA, in McLean. It is the 35th biggest state in the US in area and ranks 12th in population. The aforementioned 8 Presidents to have hailed from Virginia are Washington, Jefferson, Madison, Monroe, Harrison, Tyler, Taylor and Wilson. The College of William and Mary – the second oldest in the nation behind Harvard – is located in Williamsburg; and the state was also the first place in the US that peanuts were grown. In the last 15 Presidential elections, Virginia has gone to the Democratic candidate just twice: in 1964, when Lyndon B. Johnson easily beat Barry Goldwater, who was despised by many even in his own party; and Barack Obama carried the state in 2008. Should he win Virginia in November, the President is all but certain to win a second term in office, so it is a place Mitt Romney will be putting a lot of money and time into for the next six weeks. Congress: There is one election for the Senate in Virginia this November – incumbent Democrat Jim Webb is not seeking re-election, and the race is considered a toss-up between Tim Kaine (D) and George Allen (R). Both parties are focusing on Virginia as a crucial path to them having control of the Senate when the new Congress convenes. The state has 11 members of the House of Representatives, of which the current make up is 3 Democrats to 8 Republicans; GOP incumbents Scott Rigell (in the 2nd District) and Robert Hurt (5th) are in the closest races, but both are expected to win another term. Prior to the arrival of English and French explorers in the 17th century, New Hampshire was home to various Algonquian tribes. It was the first colony in America to adopt its own constitution, doing so in January of 1776, six months before independence was declared from Great Britain. The raid on Fort William and Mary (now named Fort Constitution), from which the Colonists obtained gunpowder and weaponry from the British, was the only battle of the Revolutionary War that took place in New Hampshire, but the state provided three regiments of troops to the Continental army. Around 1,000 New Hampshire men also fought for the Union forces in the Civil War, nearly half of whom lost their lives. New Hampshire’s main industry, until around the middle of the 20th century, was textiles, manufacturing and shoemaking. In the last 50 years, these have been replaced by high-tech companies and the electronic defense contractor, Sanders Associates, which moved to the state in 1952. A large part of New Hampshire’s economy now relies upon its proximity to the Boston Metropolitan area, with improved highways making the distance possible for people to commute. One thing that New Hampshire is most famous for is its tradition of holding one of the first to hold a primary for both Republicans and Democrats to select their nominee for President of the United States. Every four years, the state receives a lot of media attention and candidates on both sides place high importance on succeeding their, knowing that they can gain momentum with an early victory. Franklin Pierce, the 14th President of the United States, hailed from New Hampshire; as did the first American in space, Alan Shepherd. The state – which ranks 46th in area and 42nd in population in the USA – was the first to have a free public library (in 1833) and a resident of Concord, Levi Hutchins, invented the alarm clock in 1787. Portsmouth, New Hampshire, was also the location of the signing of a treaty that ended the Russo-Japanese war in 1905. New Hampshire is considered to be a swing state: between 1968 and 1988, it voted for the Republican candidate in all six elections; Presidents Clinton and Bush won there in their successful campaigns of 1992, 1996 and 2000; since then the Democrats have won three straight times. Mitt Romney does not necessarily need to win New Hampshire to take the Presidency, but losing it would mean he would have to all but sweep the swing states. Being on the East coast, it will be one of the earliest states to declare on November 6th and a victory there for the President, combined with him taking any one of Ohio, Virginia, North Carolina or Florida, will mean he is very close to securing a second term. Congress: There are no Senate elections in New Hampshire this year. The state has 2 Representatives in the House, both of whom are Republican and face the same opponents this time as they did in 2010. In the last election, the 1st district was won by Frank Guinta (R), who beat two-term incumbent Carol Shea-Porter (D) by more than 26,000 votes – but Shea-Porter is expected to win back the seat this time around. In the 2nd district, Charlie Bass (R) won his fifth term (non-consecutive) against Ann McLane Kuster (D) and the two square off again this November, in a race that is considered to be a toss-up. South Carolina – the 40th state in terms of area and 24th ranked in population, with approximately 4.6 million residents – was home to 29 Native American tribes and nations, before the arrival of European explorers decimated their number as they were exposed to new diseases. Original attempts had been made by the Spanish and French to colonize the region but, after these had failed, it was the English who established the Province of Carolina. Between 1715 and 1717, the settlers fought the Yamasee War against several Native American tribes, initiated by the Yamasee and the Ochese Creek to try to stem the spread of colonists. For the first part of this conflict, it appeared the colony may be defeated and cease to exist until, in 1716, the Cherokee joined forces with them to fight against the Creek, their traditional enemy. In 1729, the Province officially became two royal colonies, of North and South Carolina, and the latter was the first to declare independence from the British, doing so in March of 1776. Loyalists helped the British regain control of the state but, following defeat in the Battle of Cowpens in 1781, their troops retreated and many slaves escaped with them. South Carolina’s economy was based around the production of rice and cotton, both of which used slave labor to prosper and this led to them being one of the foremost defenders of the practice in the Union. In 1858, Congressman Preston Brooks from South Carolina attacked Senator Charles Sumner of Massachusetts with a metal-tipped cane, because of an anti-slavery speech he had given. The state was the first to secede from the Union, doing so in December of 1860, even before Abraham Lincoln assumed the office of President, and the first Battle of the Civil War was at Fort Sumter, South Carolina. After the war, the state was readmitted to the Union in 1868 and went through a period of Reconstruction. African-Americans were subjected to violence from whites, in particular members of the Ku Klux Klan, which led to President Ulysses S. Grant passing the Civil Rights of 1871, which was designed to enforce the provisions of the 14th Amendment and gave the Executive Branch the power to suspend habeas corpus. Because of this, many members of the KKK fled South Carolina, but racial tensions continued and African-Americans and poor white people suffered disenfranchisement, as obstacles such as poll taxes and literacy tests were introduced as requirements for people to cast their ballots. Even in recent history, the state has been behind the times in some crucial areas: between 1962 and 2000, a Confederate flag was flown on the State Capitol; while South Carolina did not ratify the Nineteenth Amendment, that extended the right to vote to women, until 1969. The economy of South Carolina is based around: agriculture, its main products being tobacco, peaches, poultry and cattle; manufacturing of textiles, cars and chemical products; and tourism, especially at Myrtle Beach, which is considered to be the golf capital of the world due to the 120 courses located there. There are no major sports teams in the state, though Duncan Park in Spartanburg is the oldest minor league baseball stadium in the country and “Shoeless” Joe Jackson – who was part of the infamous Black Sox team of 1919 – hailed from Pickens County. Andrew Jackson, the 7th President of the United States, was born in South Carolina, but his home state was Tennessee. There has not been an updated poll for South Carolina since December of last year, when President Obama led by 3%, but that was a hypothetical against candidate Romney, before he had won the nomination. If Obama were to carry the state in November, he would be the first Democrat to do so since Jimmy Carter in 1976 and I expect Governor Romney will win South Carolina and its 9 Electoral College Votes. Congress: There are no Senate election in South Carolina this year. After the reapportionment from the 2010 Census, the state will gain an extra seat in the House of Representatives, taking its total to 7. Currently, the Democrats have just 1 Congressman to the Republicans 5, with the new district also expected to be won by the GOP candidate, Tom Rice.